Made from soft French terry fabric, the NikeCourt Tennis Shorts are ideal for leisurely play or cheering on your favourite players from the stands. French terry fabric has a soft feel, helping you stay comfortable for warming up before a match or travelling to your next tournament. Elastic waistband offers a secure, customisable feel, while a 5.5" (14cm approx.) inseam provides comfortable coverage. • Fabric: Body: 58% polyester/42% cotton. Pocket bags: 100% cotton. The perfect off court tennis shorts! 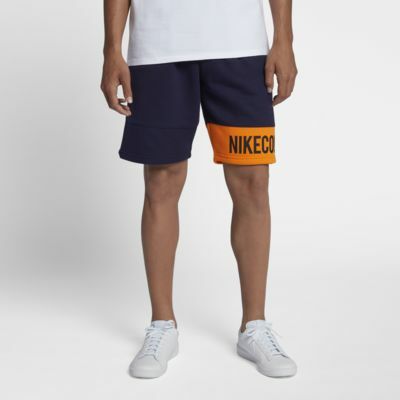 Ordered these for my son, he loved the style and colors available, the NIKE COURT printed on the side is really cool, they are shorter than usual shorts but he wanted to try it anyway. The material though is really thick cotton, had to return it, there's no way he could play tennis during summer on those. Please keep making them but change the fabric, dry fit would be perfect! Had to give 2 stars because of the fabric, style is great.